Electronic Press Kits – Cassidy Kakin: Writer. Got an EPK? You need one. I can help. Once upon a time, bands stuffed manila envelopes with hard copies of press materials and sampler CDs and sent packages off to venues and press outlets. Today, it’s a whole lot easier and more effective to give all of your promotional materials a digital home. That’s where an EPK comes in. An Electronic Press Kit is a succinct digital collection of all the media, promotional materials, and artist information you need to get a total stranger interested in your art. Think of an EPK as your elevator pitch combined with a collection of your most important music and media materials. 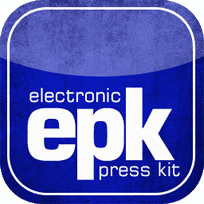 Electronic Press Kits are hosted online, and can be easily shared via email or social media. How Can An EPK Help You? By conveying all of the most important aspects of your story in one place, EPKs help you introduce yourself in a way that a basic email or phone call just can’t. By putting all of your media, links, and branded materials in one place, Electronic Press Kits make it easier for press and promoters to portray your art how you want it to be portrayed. Plus, EPKs give your communications with new contacts an air of professionalism that will set you worlds apart from every other rapper who hits up venues on twitter. Representing yourself well with an EPK can help you book new shows, gain new media contacts, and land press coverage. First, hit me up let me know you’re ready to take your branding to the next level with a professional Electronic Press Kit. From there, I’ll send you a questionnaire to learn more about your story and your art, as well as a media items check-list so you can start gathering together all of the elements that will go into your EPK. Once I have all of the materials I need, I’ll whip up your EPK and send the final hosted version your way for approval. I’ll also include tips and email templates for effectively using your EPK to communicate with new contacts. Get in contact with me ASAP to get your EPK started. A quick note: ALL of the writing services I provide can be used on artist sites. SEO and the rest is just as important for rappers as it is for other small business owners. While the services here are specifically catered to artists, check out the rest of my offerings too.